How Poor Ventilation Affects My Roof and Home? Is My Roof Vented Correctly? Although it may sound silly, the ability of your roof to breathe properly is crucial to the health and durability of your entire home. It doesn’t matter whether you live in humid and hot climates or if you are closer to the colder northern latitude. Your home, especially your roof, must have proper ventilation. The Roof Replacement Pros will gladly inspect your home if you need to determine whether your roof can breathe adequately. If you need roofing vents, our qualified experts are here to assist you with the installation. The most important role of properly ventilating a roof is moisture prevention caused by lack of airflow. Just as a poorly ventilated room will suffer from mold and mildew, a roof with poor ventilation can also experience a number of serious problems. Severe condensation will most likely affect the roofing deck first. The timber structure may swell and over time reduce its ability to hold up the roof. Later, it could form dry rot on the deck and rust on the nails which will weaken the roof further and significantly decrease your indoor air quality. The only way to prevent excess moisture and keep your home dry and mold-free is with a well-ventilated roof. Even if you don’t leave in areas where the weather is extremely hot, with inadequate ventilation, it is still possible for your roof to overheat. When your home is exposed to the sun, and your attic doesn’t have a proper outlet for hot air, the heat will quickly build up and affect your roofing materials. 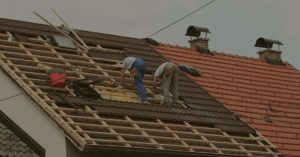 For example, the roofing membrane may shrink, and your shingles might blister, meaning you will have to repair or replace them much sooner than they should be. During hot weather, when the sun beats down on your roof, the air beneath it becomes extremely hot. This hot air can eventually get into your home and increase the need for cooling. Overall, it creates a less pleasant living space. Hot air also takes a toll on your roofing materials. Without proper ventilation, you will experience the same problem even when the weather is cold, just the other way around. Warm air from your home will transfer to your roof and melt snow, increasing your risk of creating ice dams. This clash of warm air with a cold roof will also lead to moisture buildup which may lead to mold growth or water damage. By adding proper venting and increasing the airflow around your attic and roof deck, you won’t have to worry about any of the above-mentioned problems. With a balanced flow of air, your roof will always stay cool, and you can be at peace all year round. By increasing the airflow, your roofing materials will also last longer, and you won’t have to worry about moisture buildup. Proper roof ventilation can also help you reduce your cooling costs. If you are not sure whether or not your roof is adequately ventilated, contact The Roof Replacement Pros to inspect your home. To determine if your roof is ventilated correctly, you need to understand how roofing vents work. Venting a roof requires vents for air intake and exhaust. Depending on your budget and needs, you can choose from a wide range of options. Soffit, fascia and dormer vents are typically used as roofing intake vents. To exhaust air, ridge and off-ridge vents, gable vents, and turbine vents and powered vents are mostly used. Ensuring proper airflow in your roof is not as simple as it sounds. To establish proper temperature and moisture control, the air needs to circulate smoothly and consistently. Keep in mind that poorly placed roofing vents can disrupt this airflow or even completely stop it. To achieve the desired effect, you need to determine the right amount of ventilation. The Roof Replacement Pros have great experience in installing different types of roofing vents, and we can determine the right amount of roofing ventilation for any home with ease. Our experts are aware that too much, as well as too little airflow, can cause severe roofing problems. That is why we rely on the standard 1/150 rule which means every 150 square feet of attic space requires one square foot of free vent area. Providing good ventilation in your roof is not an easy job. Only the very best roofing experts, such as The Roof Replacement Pros, can ensure you get the right amount of ventilation that will lower your cooling costs and extend the life of your roofing materials for many years. If you believe your roof may not have the venting it needs, or if you would like to hear an expert opinion, don’t hesitate to contact us today. We proudly serve the Howard, Frederick and Montgomery County area of Maryland, with locations in Frederick, Bethesda, Gaithersburg, Germantown, Silver Spring, Olney, Rockville, Montgomery Village, Laytonsville, and more.